We will add our menu on Magento BO. We have 3 instructions here. 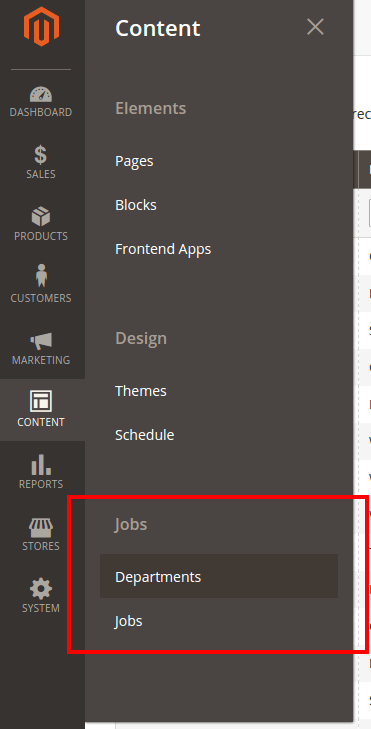 – We create the title “Jobs”, which is have “Magento_Backend::content” as parent and “Maxime_Jobs::job_head” as id. – We create the subtitle “Departments”, which is have “Maxime_Jobs::job_head” as parent, Maxime_Jobs::department” as id and “jobs/department” as action. – We create the subtitle “Jobs”, which is have “Maxime_Jobs::job_head” as parent, Maxime_Jobs::job” as id and “jobs/job” as action. You can change the sort_order value to change object position in menu. If you click on an item, nothing happens. We must create our routes and controllers. But, we will do that on the next part. We must do other stuff now ! Now, we will move our menu on a new section. You can delete this code on the XML : parent="Magento_Backend::content"
The icon image is defined by Magento. You may see our new menu because you have got all rights on the BO. But somes users can have somes roles with other permissions. So, we created new section and new menu, we must declare the new accesses. You can see 2 commented lines, you must decomment its if you left the menu on “Content” section. Else, you can delete this 2 lines. This XML define the permissions tree. Choose the role you want. Click on “Role ressources” and choose “custom” on the select field. Now we’ve got our menu, and we can manage permissions. Next step is to create admin routes and controllers !